Syracuse, NY. 2201 and 2205 East Genesee Street. Ward Wellington Ward, architect. (1919, 1923). Photo: Samuel D. Gruber. I've written about houses designed by noted Arts & Crafts architect Ward Wellington Ward on this blog before and there are so many in the city and environs that I could fill many more posts extolling their beauty - sometimes simple; often complex. In my walking tours that I have given for the Westcott Neighborhood Association I have pointed out many of these houses, and many of the tours are being posted online - in much expanded versions. 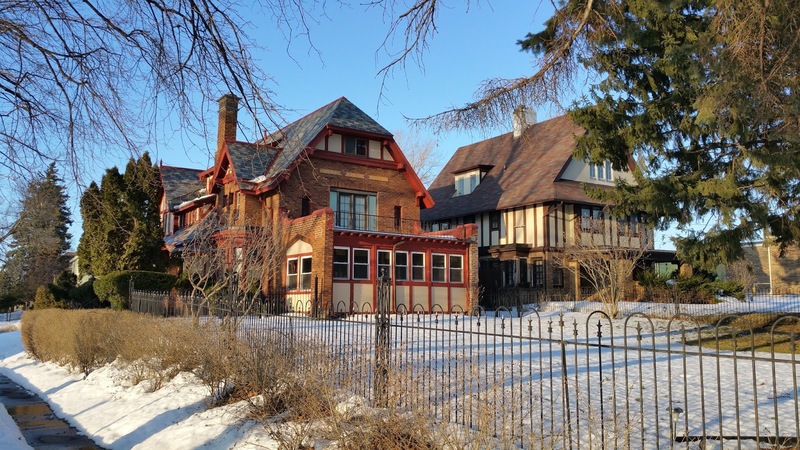 One set of houses includes two impressive "manor house" designs on East Genesee Street at Allen Street, and there are two more modest Ward houses just a half block away on the 300 block of Allen Street. Three of the houses have west facing facades, so any sunny afternoon is a fine time to take walk to view them. 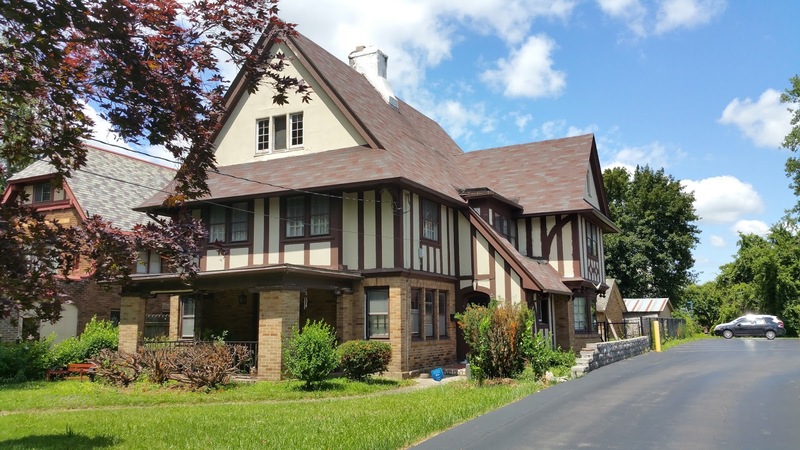 The two substantial side-by-side houses at #2201 and #2205 East Genesee Street were built in 1919 and 1923 on part of the Pennock tract, land developed by James Pennock who built his own house across East Genesee Street. Pennock developed the nearby blocks of Allen Street in the years just after 1900. Syracuse, NY. 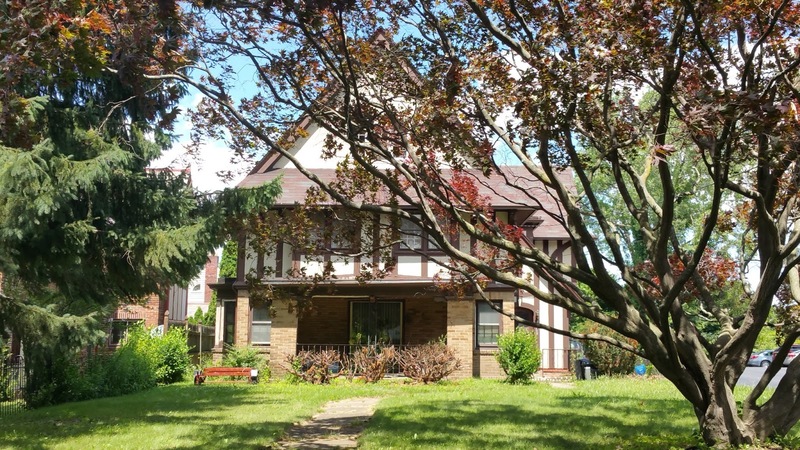 2201 East Genesee Street (Frank Collins house). Ward Wellington Ward, architect. (1919). Photo: Samuel D. Gruber. Closest to Allen Street is #2201, an impressive structure built as a new residence for Mr. And Mrs. Frank Collins. Collins, who was owner of the F. P. Collins Paint Co., was a previous client of Ward, the architect having designed a house at 423 Euclid Avenue. 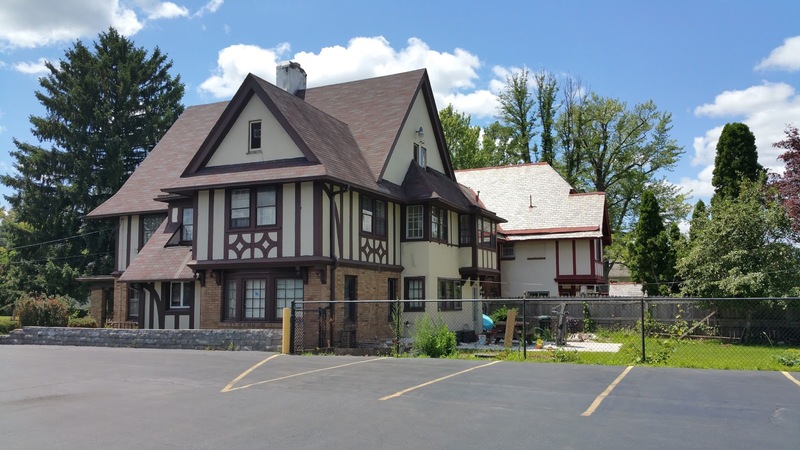 This new house on East Genesee is bigger, more ornate, and on what was in 1919, a more prominent location. Collins was born in Ireland and came to America in 1878. After settling in Rochester he came to Syracuse in 1890, where he established the paint business with his three sons, William E., John Emmett and Francis Chilton. Though the house faces East Genesee Street, the main entrance is from the 300 block of Allen Street, where Ward design two others houses, too. The two-story side-gabled Collins house has two cross gables on the Allen Street facade. It is predominately Tudor Revival in style with many of Ward’s distinctive Arts & Crafts details. 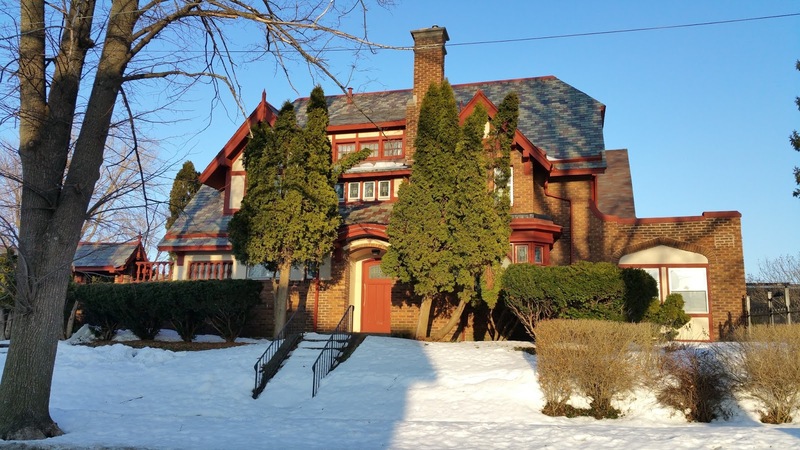 Notable exterior features include half-timbering in the gables, inset tiles in the brick facing and front stoop, and twenty-one pieces of stained glass from the Keck Studio throughout the house. The house has a structural system of brick and hollow tile supported by a concrete foundation. the roof is slate. The biggest change to the original house is that the south-facing porch has been enclosed. Inside, in addition to the stained glass windows, the house is notable for its superb Mercer Tiles around the fireplace, decorative living room floor, and many original finishes. Frank Collins who was himself a professional in providing home finishing materials, wrote to the Moravian Pottery and Tile Works in Doylestown Pennsylvania for “something which is better than ever set up in Syracuse before.” The resulting tiles represent various seasons and trades. There is a front-gabled garage clad in stucco with half-timbering. The garage has a chimney, as was often the case in Ward-designed garages, indicating that it was heated in winter. The doors are replacements, but other wise the structure is original. Syracuse, NY. 2205 East Genesee Street (Kelly-Weiskotten house). Ward Wellington Ward, architect. (1923). Photo: Samuel D. Gruber. For the lot next door to the Collins house Ward designed a house in 1922 for restaurateur John Kelley. Kelly sold the house two years later to Dr. Herman Weiskotten, Dean of the Syracuse University College of Medicine and after whom Weiskotten Hall is named. The house is distinctive for the English cottage appearance of the exterior and inside for the Mercer tile fireplace and foyer, leaded glass bookcases, stained glass windows and built-in cabinets and closets. The garage was added to the house three years after its completion is was probably not designed by Ward but it is in a comparable style. Upstate Medical University's Weiskotten Hall is now named in honor of the former Dean. In September 1936, President Franklin Delano Roosevelt lay the cornerstone for the medical school building with Weiskotten at his side. In 2013 an historical marker was placed on the site recalling Roosevelt's visit. Here's how the event was reported in the Syracuse Herald in 1936. Around the corner from the Collins house, on the 300 block of Allen Street, are two more Ward houses, both smaller, and more intimate and cottage-like. The origins of these houses is uncertain; whether they were speculative or built for specific clients. The houses were featured in Ward's self-published album of his work from the 1920s and they were identified with the then-occupants but they were not featured houses, but included in an add for Kelsey air Generators that appeared in the back of the book. 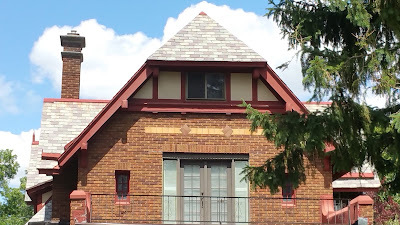 The Roy Carpenter house at 309 Allen Street is an early work and is a variant on the then popular Craftsman-style bungalow, a small cottage-like side gable and entrance house. A full second story expressed as a substantial dormer protruding from a steep roof. 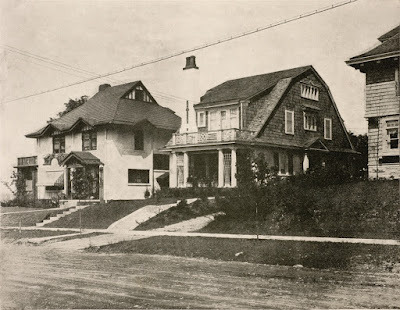 Many similar houses can be seen on Sumner, Strong, Roosevelt and other avenue, all built about the same time. In the case of the Carpenter house, the roof is of the gambrel type. there is a full porch front in the street. A tall plaster chimney with brick or tile ornament is the most distinctive exterior element. The original open parapet rail atop the front porch has been removed, but otherwise the house looks much like it did when it was built. Next door, at #301, the William McKee house is a little different. It has a more unusual roof - but of type familiar in Ward houses. The roof begins as a hipped roof but as it rises it transitions into a side gable roof. Also the horizontal eaves on all sides of the houses are frequently broken by raised angled gable like elements, filed with vertical half-timber segments, giving a lively rhythm and texture to the house. Most of the exterior of the house is covered with a flat plaster surface, providing a modernist touch on this Arts & Crafts House. Ward Wellington Ward, architect. (1912). Photo: Samuel D. Gruber. Reed, Cleota, Henry Chapman Mercer and the Moravian Pottery and Tile Works (Philadelphia: University of Pennsylvania Press, 1987). Some Recent Work [Ward Wellington Ward]. Undated [c. 1914].